“Friends of Mr. Morris will always regret that no catalogue of his complete library was ever issued, as it would have illustrated, in a remarkable manner, the real genius in selection which enabled him, in a very short space of time, to bring together so many specimens of first-rate importance” (The Guardian, 14 December 1898, p. 26). William Morris (1834–1896) was a voracious reader from an early age, but it was only in his later years that he became a determined book-collector, and all the evidence suggests that he then began to acquire books and manuscripts on a large scale primarily because of his interest in the history of book illustration and typography. Hence when he founded the Kelmscott Press in 1891, his fascination with printing led him on to increasingly ambitious purchases for his library, especially of medieval books and manuscripts. 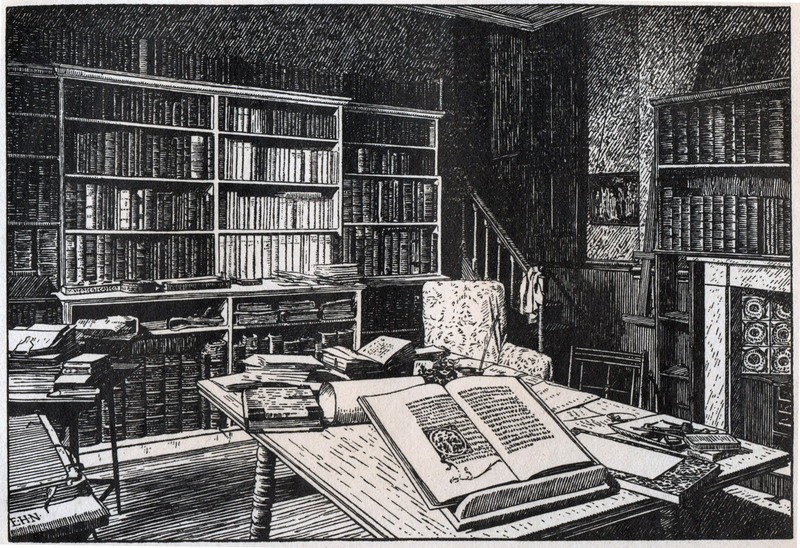 Nevertheless, he also owned a very substantial collection of nineteenth-century books—we have identified more than a thousand so far—and this point is worth emphasizing, because most published remarks on Morris’s library, including those of Morris himself and Sydney Cockerell, give the misleading impression that his bookshelves held little else but incunables. This website represents an attempt to reconstruct the personal library of one of the most influential figures of the Victorian era. Drawing upon a large number of sources, we are creating a short-title list of all the books and manuscripts Morris is known to have had in his collection. We are also including information about provenance, snippets from the Sotheby sale catalogue of Morris’s library (December 1898), buyers and prices of the lots in that auction, and links to digital copies of the titles. (We are aware, by the way, that some of those links, especially to Google Books, are not functional outside the United States because of copyright restrictions, but we hope that may change in the future.) Likewise, we are making use of the three manuscript catalogues of Morris’s books compiled during his lifetime (see Abbreviations under “MS catalogues”). At a later stage, we want to add more information about individual entries, such as allusions to them in Morris’s writings and correspondence. The story of how Morris’s collection was dispersed after his death is complex and can only be briefly summarized here. Though some of his books remained within the family, his executors, Sydney Cockerell and F. S. Ellis, arranged for a private sale of the rest of the library to Richard Bennett, a Manchester collector, who quickly disposed of a large number of items that were subsequently offered at auction by Sotheby’s (London) in December 1898. Because Henry Wellcome was the most active buyer at that sale, the Wellcome Library in London today has one of the two largest collections of titles from Morris’s library, but of course the remainder of the lots in the 1898 auction are now widely scattered. The other substantial body of material once owned by Morris is at the Morgan Library in New York, since in 1902 J. Pierpont Morgan acquired the second part of Bennett’s collection. Unfortunately the Wellcome Library sold hundreds of Morris’s books during the 1930s and 1940s, and even the Morgan has deaccessioned a few titles that were treated as duplicates. We have also decided, after some hesitation, to include books that were owned by Morris’s wife and daughters before his death, on the assumption that these books were all at one time under the roofs of Kelmscott House and Kelmscott Manor, and were no doubt in some instances mingled with Morris’s modern books. (Following the same principle, we are recording Morris’s personal copies of Kelmscott Press books that were published during his lifetime.) Similarly, we are listing books given by Morris to others, except for copies of his own works and Kelmscott Press titles. In a few instances, we know that these books came directly from his own bookshelves as duplicate copies, and the books he presented to others often tell us something about Morris’s literary tastes and preferences. We are of course recording medieval and Renaissance manuscripts owned by Morris, though we have excluded his calligraphic exercises and drafts of his own writings. For manuscripts later acquired by J. Pierpont Morgan, we are making use of additional information found in Sydney Cockerell’s marginalia in his copy of the Morgan Catalogue (see Abbreviations) now at the Lilly Library, Indiana University; we are also providing the first two paragraphs of each manuscript description in the Morgan Catalogue. In order to give a better sense of how much Morris is likely to have paid for his early books and manuscripts, we are gradually adding details from the Ellis valuation (see Abbreviations) compiled after Morris’s death. Obviously this site continues to be a work in progress. We welcome suggestions, corrections, and especially new information; we are diligently searching in all the known sources, but we urge readers to tell us about books and manuscripts once in Morris’s possession that we may have overlooked. We should add that we maintain another website devoted to the Kelmscott Chaucer. Morris’s book label, created by his executors. For another discussion of Morris’s book-buying habits, see Richard Landon, A Long Way from the Armstrong Beer Parlour: A Life in Rare Books, ed. Marie Elena Korey (Toronto: Thomas Fisher Rare Book Library; New Castle, Del. : Oak Knoll Press, 2014), pp. 323–38. Mark Samuels Lasner’s handlist of a Grolier Club exhibition, William Morris: The Collector as Creator (New York: Grolier Club, 1996), also offers a good description of Morris’s library and how it was formed. A useful, more general study is Richard W. Oram with Joseph Nicholson, ed., Collecting, Curating, and Researching Writers’ Libraries (Lanham, Md. : Rowman & Littlefield, 2014).